A beautiful lawn is surely in the eyes of the beholder. For some, the thought of dandelions or other broadleaved plants within their realm is simply too much. Marketing trends in the landscape industry have picked up on this demand, and created complicated programs that involve fertilizers and pesticides. Many people think these are requirements of lawn maintenance. A good raking each spring with a flexible tooth rake will do your lawn wonders! Removing thatch helps your lawn breath and allows new shoots to fill in open spaces. The pile of dead clippings is great for your compost pile. The pH of the soil (acidity level) needs to be at about 6.5 for turf plants to effectively utilize the micro nutrients existing in the soil. Use of these nutrients is part of the process in making the plants healthy. Most soils in the northeast are naturally very low in pH ( too acidic), making these nutrients unavailable. When the soil is low in pH the weeds are able to thrive, while the desirable plants become weak. Soil testing is available through the New England State Universities and their extension services. The tests don’t cost a lot and they give you information that that help you build your soils to desirable levels without wasting a lot of time and money doing the wrong thing. 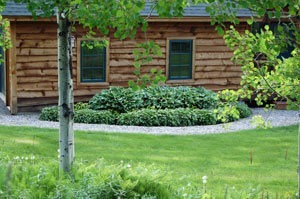 When building a new lawn, take the extra time to add extra organic matter and build the soil up. This will save in the long run and create a lawn you can be proud of without a lot of steps each year. After a lawn is in, but showing signs of not looking the best without regular applications of fertilizers, a topdressing of compost can help to build the soil up, minimizing the need for adding chemical products. Organic matter aids in moisture retention while contributing nutrients necessary to support plant life. A suggested application rate would be 2 yds per 5,000 sf of lawn area. Rake it out as consistently as possible. 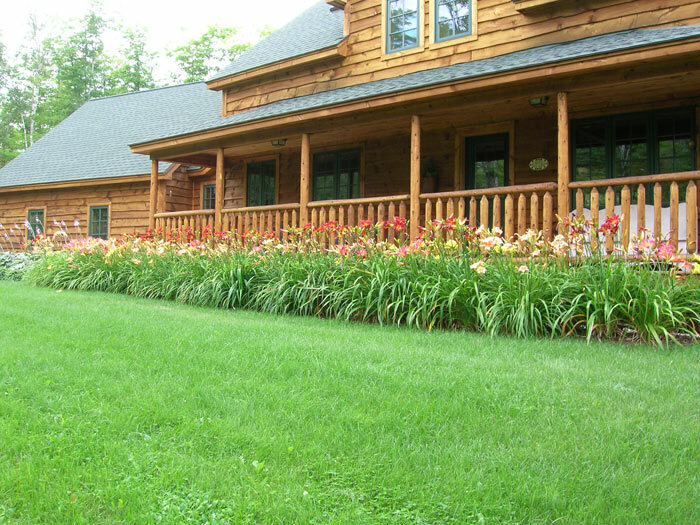 Most established lawns do fine with one application of fertilizer each year. Early spring is best, and try to purchase a phosphorus free fertilizer when applying near water bodies. Most soils have sufficient amounts of phosphorus already, your soil test can tell you this. Set your mower to 2 ½ – 3” . The plants themselves can shade their own roots, minimizing drying and unwanted weeds. When the dry spells hit, allow your grass to go dormant. It is the plants natural reaction to stressful conditions. It will regenerate from roots after the drought has passed. Have your lawn aerated by a professional once every year or two in the fall. Aeration breaks down thatch and helps the lawn to breathe. After a core aeration, overseeding with a good lawn seed will help new plants generate in thin spots. Milky Spore Disease used for grub control has not been documented to give adequate grub control in inland New England, most likely due to the shortness of summer warmth, and is very expensive to apply. Beneficial nematodes, another biological control alternative, seems to have shown more promise. By following these low input lawn practices, your lawn will grow healthy and naturally crowd out weeds. You can pull a few dandelions individually if they bother you without having to spray and herbicide over the entire lawn. Best of all, following these low input lawn steps to a healthy lawn will help protect groundwater, reduce pesticide exposure, and save you money! Copyright © [wpsos_year] Norpine Landscape and its licensors. All rights reserved.